The United States Congress designated the Charles C. Deam Wilderness (map) in 1982 and it now has a total of 12,472 acres. All of this wilderness is located in Indiana and is managed by the Forest Service. Settlers first arrived in Indiana's only Wilderness in 1826. This was one of the last pieces of the state to have its steep hills and narrow ridge tops tamed by humans. As recently as half a century ago, 81 farms dotted the area, every ridge was planted in corn or hay, and 57 miles of roads traversed the higher ground. Although the landscape still shows considerable evidence of human alterations, the Wilderness is slowly returning to its natural wild state. Bird species, including flycatchers, scarlet tanagers, red-eyed vireos, hawks, and woodpeckers, now thrive in the gradually thickening forest. Among the reptiles you'll find are the poisonous timber rattlesnake and the copperhead. Named for the first Indiana State Forester, the Charles C. Deam Wilderness is bordered on the north by Monroe Lake, Indiana's largest reservoir. The Wilderness stands divided into a northern and smaller southern section by the Tower Ridge Road, and the right-of-way of this road remains non-Wilderness. Old roads can be followed on foot off of Tower Ridge Road into the Wilderness. Horses are required to stay on designated trails only. Blackwell Campground is maintained at the western end of the road. Chiggers, ticks, and poison ivy thrive in summer months. Horsepacking and hunting are allowed throughout the area. 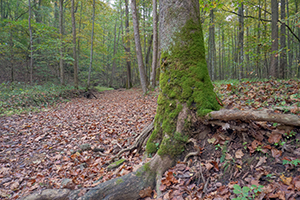 Planning to Visit the Charles C. Deam Wilderness? How to follow the seven standard Leave No Trace principles differs in different parts of the country (desert vs. Rocky Mountains). Click on any of the principles listed below to learn more about how they apply in the Charles C. Deam Wilderness.